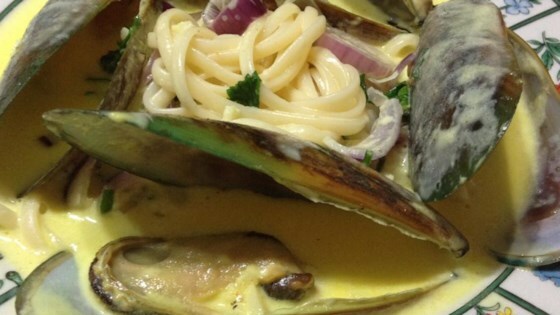 "Mussels steamed in a curry cream sauce, an easy and delicious recipe, you'll love it!" In a large saucepan, cook shallots and garlic in simmering wine until translucent. Stir in cream and curry powder. When sauce is heated through, add mussels. Cover, and steam mussels for a few minutes, until their shells open wide. With a slotted spoon, transfer steamed mussels to a bowl, leaving the sauce in the pan. Discard any unopened mussels. Whisk butter into the cream sauce. Turn heat off, and stir in parsley and green onions. Serve immediately. See how to make a classic vodka and tomato cream sauce with a kick. If you like Curry and Garlic you will love this recipe!! I give it 2 thumbs up and an A+ to the taste buds. This was great. I used a tablespoon of dijon mustard instead of curry as one reviewer suggested. It was exactly like the dish I order from a local restaurant. Excellent! I followed the recipe to a t except I used half and half instead of cream. We had this on a bed of pasta but fresh bread to dip in the oh-so-yummy sauce would be great too! really easy, everyone loved it. thanks.